The peak of the fund of hedge funds sector was in 2008 (by AUM and numbers of funds) and in aggregate the sector has shrunk ever since (by those two measures). The pace of change has varied but the direction hasn’t. In the first half of last year net redemptions accelerated to the extent that at one time fund of funds were on course to suffer redemptions of $90bn for the whole of 2013. 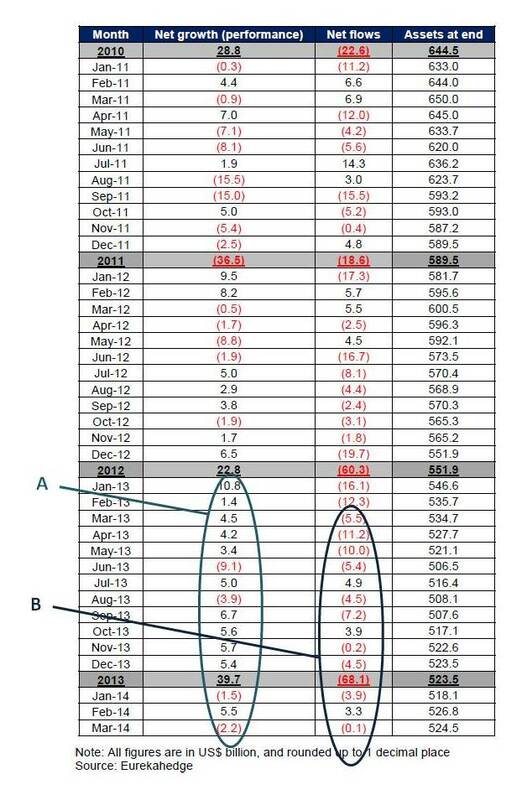 As the table below shows the 2013 outflows were significantly less than $90bn – a still massive $68bn, equivalent to 12% of the AUM at the start of the year, but the rate of net redemptions has slowed from the middle of last year (see zone B of the table) . The rate of net redemptions has slowed from $60.5bn in the 1H 2013, to $7.6bn in the 2H 2013, and then only $0.7bn in the 1Q of 2014. The pattern of redemptions has also changed from the middle of last year. 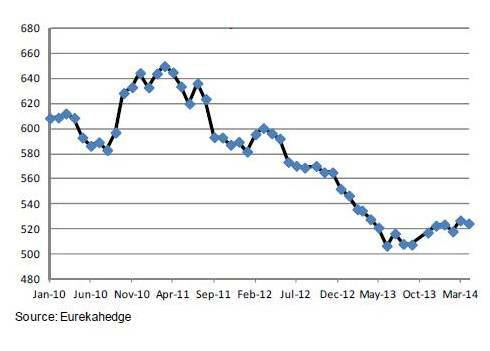 In the year to last June there were no months in which Eurekahedge recorded net inflows to funds of hedge funds. Over the last 9 months there have been three months in which more capital has been subscribed in multi-manager hedge funds than redeemed from them (positive net subscriptions). Returns have become much more positive for funds of hedge funds since the middle of last year compared to the previous period. The last 15 months covered by the oval marked A in the table above contains four losing months. The previous 15-month period contained seven losing months. So positive absolute returns for funds of funds have contributed to growing AUM of the sector, at the same time as redemptions have lessened. The combination of the changes to returns and the tapering of redemptions has been a minor recovery in the assets under management of sector, as shown in the graphic below. There was plenty of pressure on the managements of funds of funds a year ago – a period of large redemptions and negative returns. That pressure has lessened for some of them, and in all likelihood lessened for a lot more of the firms than we suspected at the time. That is not to say that the old days of pre-Credit Crunch growth are back for funds of funds, but rather that we are in a counter-trend reversal in the interim.